An Openreach training centre in Bradford is celebrating a successful first year with news that more than 5,500 engineers and new recruits have been trained at the facility since its official launch in March last year. More than 100 trainee engineers have already been recruited in the past year from across West Yorkshire and Openreach announced in January that a further 90 local trainee engineer jobs will be filled in the coming year. Across the UK, more than 3,000 trainee engineers will be recruited, mainly to deliver the company’s ‘Fibre First’ programme, which is bringing faster, more reliable and future proof Fibre to the Premises (FTTP) technology to millions of front doors. To celebrate the news the Leaders of both Bradford and Leeds councils visited the training centre to find out more and meet some of the new recruits. 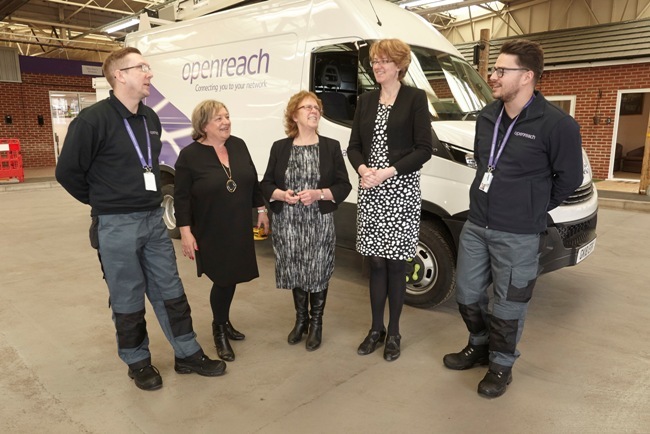 Coun Judith Blake, leader of Leeds City Council, said: “It was fantastic to visit Openreach’s regional training centre this morning and meet some of the local engineers that will be installing superfast and ultrafast broadband infrastructure across our region. More than £1m has been invested in the Bradford centre to transform it from a 1970’s office, storage and workshop unit into the vast training facility it is today. It’s a template for Openreach training centres across the UK – giving recruits and engineers a safe, real-life network get to grips with their work. Central to the school is ‘Open Street’, which Openreach has built to mimic a typical residential road. Engineers can experience a typical working day – from cabling to jointing and repairs, working underground or overhead, climbing telephone poles and installing new services inside customers’ homes. Kim Mears, Openreach’s managing director, said: “The training centre is a huge asset to Openreach and to Bradford. More than 5,500 thousand engineers from across the North of England have trained here since it opened. “In just the past year we have recruited more than 100 trainee engineers locally and we are looking to recruit a further 90 trainee engineers from across West Yorkshire. We know from past experience that we will have no problem filling those positions with top quality candidates. Openreach’s ‘Fibre First’ programme will deliver expanded FTTP networks in up to 40 towns, cities and boroughs. It has committed to making FTTP available in three million British homes and business by the end of 2020 and, if the conditions are right, intends to go significantly further, bringing the benefits of FTTP technology to the majority of homes and businesses in the UK.